This week, we are going to talk about Art, more precisely, about painting and illustration! 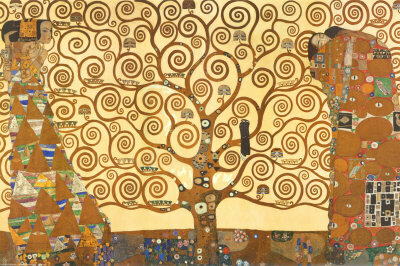 I’ve chosen Gustav Klimt’s works for my article, because his masterpieces are being exhibited in Liverpool, UK, at the Tate Museum. Also, because I like his unique style, which contains drops of an oneiric, exotic and magic elixir. Klimt paints the exaltation of glory (I would like to write that he paints men’s glorious exuberances, but I am not sure if it makes sense!). A work of virtuosity, in which the artist does not doubt his own vision and style, applying real gilt (a thin layer of gold), coloured glass and mother-of-pearl whenever needed. For Klimt, it is not a matter of using something that was unnecessary and expensive, but using the proper materials for providing the idea of sublimity and splendor. Above, I found a detail of the painting called “The Kiss for the World”. In the actual painting, the naked couple is surrounded by a choir of “angels” or “people of all nations of Europe”. It is a very powerful idea, beautifully executed. 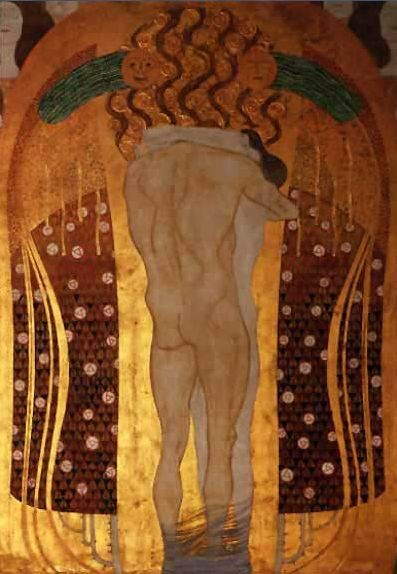 My two favourite paintings of his are “The Kiss”, 1907, and “The Tree of Life”, 1909. They are delicate and powerful, elegant and magic, earthbound and transcendent, all at the same time. They are Klimt. Pat, I’m a Klimt’s fan also =)! What I like the most in his work is the beautiful composition of patterns that he makes. And the vibrant combination of colors! I love his “sliding women” (this is a name I invented – in Portuguese! – “mulheres escorridas”. I think it describes perfectly the image I saw through his paintings ;). 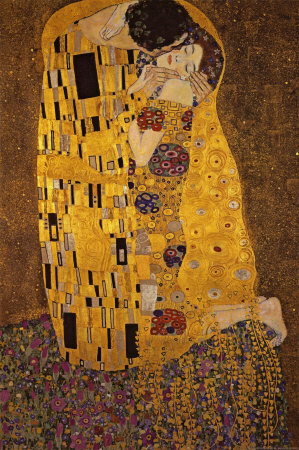 I wish I could see an original Klimt’s painting one day! Pat, I has a doubt in a sentence of your post: “My two favourite paintings of his are…”. I would like to say “My two favourite paintings of him are…”. Is that wrong? (a) A friend of my is coming. (b) A friend of mine is coming. (a) I tried a recipe of you and it was delicious. (b) I tried a recipe of yours and it was delicious. The correct answers are “b”. Now… why?! Mmm. Another possible explanation is that, if we use “paintings of him”, it would have a different meaning or, at least, leave room for an ambiguous interpretation: were they paintings made by Klimt or paintings portraying Klimt as a subject? WordPress didn’t send me this comment… It’s strange, isn’t it? This is the reason why I am replying just today :-p! Yes, it makes sense! “painting of him” could seem that someone paint Klimt’s portraits! Thanx 4 your weblog. I got searched about the famous painting e.g. “The tree of Life”. I own a replica but I do not know whose that? I know Gustav Klimt but I didn’t know that masterpiece.